Once every 12 years, millions of the world's most zealous Hindu pilgrims gather at the confluence of the Ganges and Yamuna rivers near the city of Allahabad for the greatest of India's immersion rituals, the Maha Kumbh Mela. This year's Maha Kumbh Mela is particularly auspicious, being the first of the new millennium and coinciding with an astrological planetary alignment occurring only once every 144 years. By the time the 2001 Kumbh Mela ends on February 21st, approximately 70 million saints, sinners, Sadhus, faith healers, preachers, gurus, charlatans and devotees from across India and the world will have participated in perhaps the single most colossal gathering of humanity since the dawn of time. In Hindu mythology, Gods and demons fought over the pot (Kumbh) of the divine nectar of immortality. The Gods ultimately obtained the pot of nectar, spilling some back on the earth, upon four cities in northeastern India: Allahabad, Ujjain, Nasik and Haridwar. The Kumbh Mela rotates between these sites every four years. Allahabad, (the modern name of the holy city Prayag, meaning "holiest of the holy") located at the confluence of the Ganga, and Yamuna rivers is considered the most sacred and important location for the Mela. 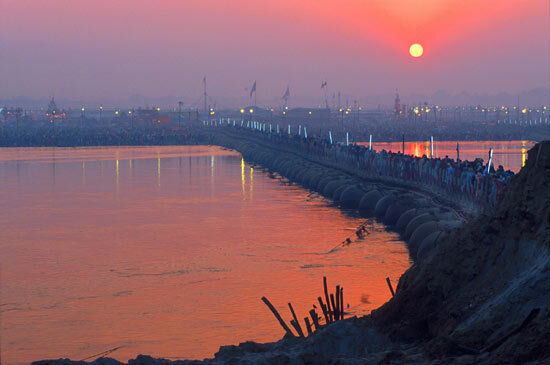 Hindus believe that during this year's Kumbh Mela a bath in the Sangam (the holy confluence of the Ganga and Yamuna rivers) will cleanse them of their sins, and grant an escape from the endless cycle of reincarnation. The Maha Kumbh Mela is truly a microcosm of Indian society at its most spectacular. The six-week spectacle is a passion filled festival, which transcends creed, caste and religion. For the throngs of Hindu devotees who will travel here it is a chance at salvation. Of the 70 million or so attendees at the Kumbh, most are rural villagers and commoners who have traveled for days, weeks or even months by any means possible on a personal search for the divine. Carrying bundles of provisions on their heads, unprepared for the low temperatures, they will sleep on the open ground; eat whatever is available and brave conditions that most westerners would find unimaginable. They have come for the opportunity of a lifetime, the opportunity for a miraculous dip into the cleansingly frigid waters of the Ganges on this sacred occasion. I had arrived in New Delhi on January 19th, 2001 meeting my friend from past trips, Satkamal Singh, a Sikh cab driver. We would leave the next morning for the fifteen-hour road trip to Allahabad. Acting as my translator, guide, negotiator, photographic assistant and personal security officer, Satkamal would be an integral part of my plan to chronicle the biggest Kumbh in history. A key component of this trip was my desire to photograph Sadhus, India's religious holy men, many of whom have decided to forgo normal life, renounce all belongings, and live nomadic or reclusive lives sustained by herbs, handouts and hashish. Protected by the armor of nakedness, the most militant of the Sadhus, the Nagas, were top on my priority list. Nagas, whose ascetic traditions date back more than 2000 years, have on occasion defended Hinduism against the fervor of a younger religion, Islam. The Nagas are considered the most Holy and revered among the Sadhu sects. 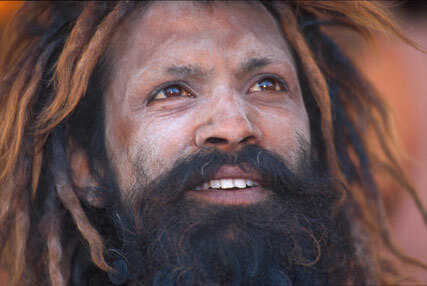 The term "holy" however, can sometimes be a misnomer since India's Sadhus are not all seekers of God. The unmistakable dress (or lack there of) does impart respect among the faithful, but it is a known fact that some Sadhus are criminals wanted by police for murders, rapes, swindling or trade in contraband and narcotics. 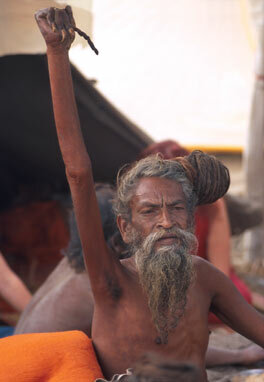 Amar Bharti Baba, his right arm held aloft for 27 years. During my days in the Sadhu camps, I met fascinatingly bizarre characters, many of whom have taken on various penances as signs of ultimate devotion. I spent time with Amar Bharti Baba, a man who's now petrified arm has been held aloft for the past 27 years. I met Radhey Puri Naga Baba, a man standing on one leg for nearly a decade, his feet swollen to twice their normal size. I visited the midget Sadhu, Bawan Giri Baba, a 62 year old who stands barely two feet tall. Countless others who make up the 180,000 or so Sadhus who attend the Kumbh, bury themselves in the sand, sleep on piles of thorn bushes or remain silent for years. Some are regarded as prophets, saints and gurus-others as outcasts or criminals. In my days with the Sadhus I was questioned, blessed, dismissed, and hustled. I was offered spiritual advice, tea, marijuana and hashish more times than I can count. 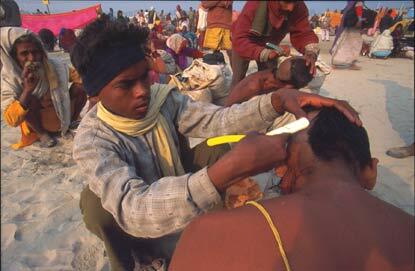 5000 barbers were on hand, a shave cost 10 Rupees, or about 25 cents. Apart from the Sadhu ashrams, the entire Mela grounds were a riot of sights, sounds, smells, colors and movement. Among the crowd were some 5000 barbers, on site to service the millions who elected to have their heads shaved before bathing in the Sangam. A shaved head costs around 10 Rupees (25 cents)-a small price to pay for a spiritual advantage (Hindu's believe that each strand of hair is the equivalent of buying a cow for the God of your fancy). Shaving one's head therefore speeds up one's journey to heaven. Intermingled with the barbers were legions of beggars who offered yet another way to create good Karma for one's self. I witnessed even the poorest of pilgrims filling a beggar's extended hand with anything from a rupee to a cup of rice. Beggars in India provide a unique type of symbiotic relationship with those who are more fortunate. Begging allows those who are able to give, the opportunity to do a good deed. 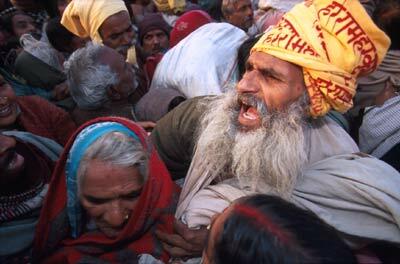 Beggars come in all types, but none were more heart wrenching than the hundreds of lepers at the Kumbh. Many were wheeled in on makeshift wooden carts or carried on the backs of family members. Almost all the lepers were covered with wool blankets, their effected limbs bandaged with hopelessly soiled rags. Partial limbs protruded from beneath blankets for all to see, many lacked fingers, toes, or entire hands and feet. The most unfortunate lepers, with advanced disease, quivered and shook uncontrollably, as if shivering, despite the stifling mid day heat. Meanwhile, just steps away, processions of gilded coaches draped in silk, announced the arrival of important religious leaders. Competing for attention in this already deafening cacophony, were the chants of passing processions, intermingled with loudspeakers that blasted anything from religious mantras, to announcements in Hindi about cattle insurance and cigarettes. The decibel level seemed to deafen all but the most calloused Indian ears. At one point I decided to call my wife back in California, using one of the many STD phone booths set up in small shacks on the Mela grounds. STD phones, ubiquitous in India, resemble taxi-meters; an L.E.D. read-out displays the cost in Rupees as the call progresses. Once my connection was made I shouted into the receiver and struggled to hear my wife's responses. Conversation was nearly impossible so finally; I held the phone in the air to let her experience the incredible din. As my phone bill neared two hundred Rupees, I noticed the phone booth operator grinning from ear to ear…I'm sure this was the most expensive call of the day. 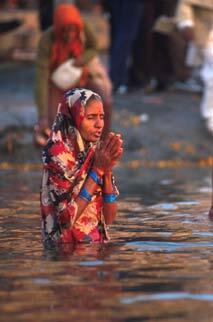 January 24th - Mauni Amavasya, the most auspicious bathing day-an estimated thirty million people would cleanse themselves in the sacred river. That day proved to be the most extraordinary day of the Mela and perhaps one of the most extraordinary days of my life. Rising at 3:00 am Satkamal and I began our journey from Allahabad town towards the fairgrounds. The sea of humanity we encountered was utterly staggering, it seemed that the world's population was singularly headed towards the Sangam. Arriving on site we quickly realized that moving around today would be an experience all its own. Being captured and propelled along with tens of thousands of other human beings through fenced off paths to the river was beyond imagination. Like blood cells in a vessel, those of us in the middle of this stream of humanity moved effortlessly, while those along the fence, slowed by even the slightest friction from a fencepost or other obstruction became squashed or spun like debris caught in the eddy of a flowing stream. At one point I noticed an old woman stumble. Gripped in terror she began to scream as the surging crowd, unable to stop its forward momentum, flowed onward compressing around her. Police began to furiously blow whistles and beat lathis (bamboo sticks) on baskets of provisions balanced atop people's heads, in an attempt to draw attention and slow the onslaught. The makeshift bamboo fence, lashed together with twine, unable to contain the swelling mass, burst open. Miraculously, the old woman and those caught in the crush, spilled out a gaping hole to relative safety. Families separated in this melee began to wail and shout as those left within the stream were helplessly propelled forward, leaving those outside the fence unable to keep pace. It occurred to me that I had just witnessed this entire sequence through the viewfinder of my camera when I reached the thirty-sixth frame. As I finally lowered the camera from my face, Satkamal was nowhere to be seen. As we surged towards the river I concentrated my attention on positioning myself to photograph the processions of Sadhus on their return from the Sangam. Separated from his family but unable to exit the flow, a man tries desperately to alert his family members. Slightly after dawn, now hopelessly separated from Satkamal, I broke ranks from the crowd, squeezed through a narrow passage between some tents and ducked under a police blockade. Suddenly, I found myself, the lone photographer, in a restricted area, staring down nearly 200 unclothed, ash-smeared, dreadlocked, Naga Sadhus, many wielding clubs, swords or tridents. Assessing my only escape route, the scaling of an eight-foot high bamboo fence, followed by a leap into the throng below-my adrenaline surged. My mind raced with the prior day's report of an unfortunate photographer, whose camera was smashed by angry Sadhus and a police attack that left six journalists hospitalized. At this point I had a decision to make- to shoot or not to shoot. I decided to stand my ground, after all I had come halfway around the world to capture these images and this opportunity would not present itself again for another 144 years. I scanned the crowd of naked revelers searching for a familiar or friendly face but to no avail. Motioning with my camera to one of the friendlier looking Sadhus, I received the typical Indian nod of the head, signaling that it was ok to start shooting. As I lifted my camera, a police officer, under orders to restrict photography of women bathers and naked Sadhus, instructed me in Hindi and unmistakable sign language, to put the camera down. Unfortunately, Satkamal was not here to help me negotiate a bakshish (bribe). My heart sank thinking that I might miss the shot, but today the Gods were smiling on me, a disturbance broke out about fifty feet away and the police left to investigate. The opportunity to start photographing began just as the procession of Sadhus started to move forward. Juggling two cameras I was able to snap off about forty frames of the naked Nagas. Almost as quickly as it began, the Nagas were gone. Exhausted yet exhilarated, I was pleased to notice that I had survived, unharmed. I unloaded the two canisters of exposed film and quickly stashed them deep in by breast pocket. 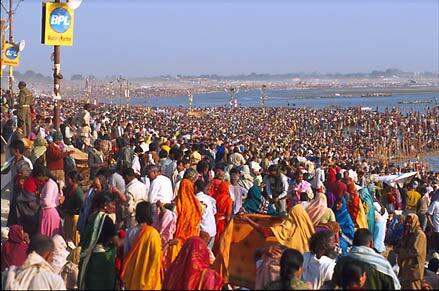 This year's Kumbh was one of the most organized ever. Authorities spent millions on planning, infrastructure, logistics and security. In preparation for the gathering, orders for 13,000 tons of flour, 7,800 tons of rice and 5,000 tons of sugar were placed. 20,000 latrines were constructed. Fifteen temporary pontoon bridges were placed to span the river, complete with repair crews who constantly rebuilt sections of the bridges damaged by the staggering foot traffic. Five computer centers, a plethora of outdoor movie theaters, six petrol stations, countless tea shops, ashrams and dining facilities rounded out the 18 square mile temporary tent city that had sprung up on the dusty riverbed. Some 20,000 police were deployed along with navy divers, mine sweepers and bomb sniffing dogs. On January 24th, Mela officials reported 30,000 people lost or separated from their families. Using the worlds largest public address system, the Mela's lost and found centers set up at strategic locations all over the fairgrounds attempted to reunite disconnected families. Despite a history of deadly stampedes at the Kumbh which killed 500-1000 people in 1954 and another 60 people in 1989, along with disturbing reports of possible terrorist attacks-VIP's including the Dalai Lama and Sonia Gandhi were in attendance. 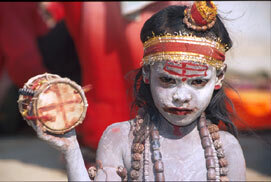 A child Sadhu, covered in ash, beats a drum to attract donations. After 14 hours of intense shooting, with my precious film safely tucked away, I decided to start back towards Allahabad. Crossing the river to town using the pontoon bridges turned out to be impossible. I made two attempts but gave up after more than an hour, having made little or no progress trying to enter the huge funnels of people. While aborting my second bridge crossing attempt, I felt someone gently take my hand. I looked down expecting to see a child but saw a visibly frightened, frail looking, elderly woman, no more than five feet tall. With tears welling in her eyes, she explained to me that the day before, she had witnessed two women nearly crushed to death in a similar situation near the river. Too short to see which way to get out, she asked if I would help her escape the deluge, I said that I would. With a vise-like grip on each other's arms, I pulled her along behind me. Using a technique similar to exiting a rip-current at the beach, we moved at an angle slightly oblique to the direction of flow. After a long fifteen minute struggle, covering little more than fifty yards, I was able to dislodge her from the tightly compressed crowd. Free of the flow and sweating profusely, she hugged me and we parted company. Finding no other way back to Allahabad, but to circumvent the pontoon bridges, I reluctantly decided on a lengthy five mile detour back across the Mela grounds and over a traffic bridge. It seemed that several million people all had the same idea, but at least we were moving forward. Once on top of the bridge, the aerial view afforded a different and unique perspective of the enormity of the Kumbh Mela below. I took the opportunity to stop and make several photographs, then moved on. Slightly after dark, I finally arrived back in Allahabad. Satkamal, who had expected to see me hours before, looked relieved as I walked through the door to our hotel room. Later that evening we compared notes over a typical meal of curry fried rice and basked in the collective excitement of that epic day. Ten days later, while flying back to Los Angeles, I reflected on this, my third and perhaps most fascinating visit to India. I had left home three weeks prior, thinking I would learn about India and returned, having learned a great deal about myself. India has once again presented me with new questions, knowledge and perspectives which I will likely ponder for months. Of my experiences at the Maha Kumbh Mela, I will not only remember the massive crowds, the exotic and bizarre Sadhus, the flamboyant gilded processions of saints and the helpless lepers, but also the kind, gentle, friendly Hindu pilgrims with whom I had an opportunity to share the climax of perhaps the world's most colossal spiritual event. Traveling to the far corners of the world while searching for seldom-visited locations, award-winning photographer Karl Grobl attempts to reveal the inner spirit of the indigenous people of developing countries. Through his photographs, Grobl strives to highlight those basic human elements that comprise the fabric binding all cultures together in a rapidly homogenizing global community. He believes that awareness is requisite to the promotion and preservation of ethnic and cultural diversity. Grobl's striking images, awash in color, capture the essence of societies still clinging tenaciously to ceremony, mysticism, and tradition in a world rushing headlong into the new millenium. The goal of Grobl's portraits is to offer his viewer a glimpse of this living history and to provide an opportunity for reflection, understanding, and appreciation of its value. Grobl's body of work includes images from Mexico, Guatemala, Ecuador, Peru, Thailand, India, Nepal, Laos and Burma. A voracious reader with an insatiable wanderlust, he studies the culture, geography and language of the people he plans to portrait. Grobl believes that a thorough understanding of cultural elements, the physical environment, and an ability to communicate are essential components necessary to establish rapport with his subjects. By way of this rapport, Grobl peers beyond the surface, and, through his photographs reveals a unique, personal and genuine reflection of his subjects character. 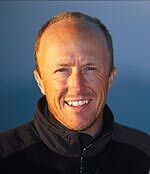 Karl Grobl is a freelance photographer based in San Diego, California. His work has been exhibited publicly and in private collections across the United States and abroad. Grobls next projects include portraits of India and Bolivia. He is a regular lecturer on indigenous cultures, anthropology and travel in Asia, Mexico, Central America and South America.